For those with money to burn, there are numerous opportunities to incinerate it this Easter, mainly on eggs which look pretty but taste merely OK. There is the Madame Oiseau polka dot egg (150g, £16.95, Liberty) – yes, 17 quid for some dots – or, at Harrods, handmade eggs encrusted with fruit and nuts (400g, £29.95). These are ideal for the Russian oligarch struggling to find that perfect gift for his mistress this Easter (and pinpoint consumer advice like that is why so many shady billionaires read The Guardian. Hi guys!). At this rarefied level, there is a tendency to decorate the front of the egg with an almost heraldic crest. In the case of Cocoa Loco’s dark chocolate ginger egg (225g, £11.99, Abel & Cole), the crest is crystallised stem ginger, isolated in a big, unedifying lump on the front of the egg. It is weird. As is the almost universal use of smooth, silky Belgian chocolate which I often find ineffectually milky in flavour, and all too sickly (or is it the prices making me nauseous?). Talking of which, the truffles in Montezuma’s milk chocolate truffle egg (359g, £16, Moonpig), heavy with vanilla and whipped cream, are almost unbearably rich. Embedded with chunks of real Dorset honeycomb, Chococo’s honeycomb egg (175g, £11.95, Liberty) offers sophisticated flavours, but bear in mind that this is £12 for what is, essentially, an upmarket Crunchie egg. The Chocolate Society’s eggs (190g, £25) look like ornaments that a successful architect might dress their home with and, based on 35% cocoa solids Valrhona milk chocolate – the Rolls Royce of confectionary – are very classy. As with Betty’s Venezuelan egg (300g, £22.50), that chocolate has been tempered to a remarkable smoothness and is not overly sweet. Prestat’s single-origin dark chocolate egg, and particularly its sensational sea-salt caramel truffles (£15, Liberty), will massage your pleasure centres in a deep and meaningful way. The Prestat eggs come in glamorous boxes, cosseted in bright tissue paper, with truffles in a variety of flavours (London gin, red velvet). 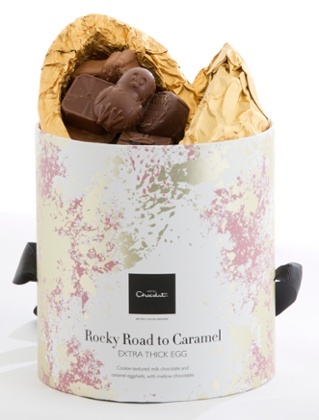 Pound for pound, Hotel Chocolat’s Rocky Road to Caramel (510g, £27) is probably the best luxe egg out there. It comprises two hefty, extra-thick shell halves of lush chocolate, one impregnated with puffed rice and cookie pieces, the other flavoured with caramel. The shell encases chocolates (salted praline and caramel, a clever florentine riff) so exquisite and intense, you will be forced to eke them out over – ooh – at least a day. Refined but a bit childish, it is the perfect British egg. This year, M&S is selling several eggs that Louis XIV would consider a bit OTT. An ornate 1kg, £40 (!) golden lattice egg, finished with gold lustre, was smashed to bits in transit (by the taste police, perhaps); a “feuilletine” egg (yes, I had to Google it; basically, we’re talking crunchy golden flakes; 385g, £15), asks: “How would an Easter egg taste if you coated it in cornflakes?” Answer: not pleasant. Asda’s Extra Special fruit and nut dark chocolate egg (245g, £6) uses the wrong fruit (sultanas, cranberries), as a front crest embedded in white chocolate. Those mouthfuls are a cloyingly sweet mess. What happened to distributing the fruit and nuts through the chocolate? Sainsbury’s Taste the Difference Belgian milk chocolate egg, with chocolate pearls “set” (note the jeweller’s language) in dark chocolate (450g, £10), is a similar muddle, any bittersweet notes lost in the mix. Dry, dusty brownie pieces hobble Thornton’s hazelnut brownie egg (432g, £12, Clinton’s), whose dark chocolate shell lacks long, fruity complexity. All this badly executed bling had me pining for the Co-op’s Popping Candy Egg (160g, £5; what do you mean it’s just for kids?). 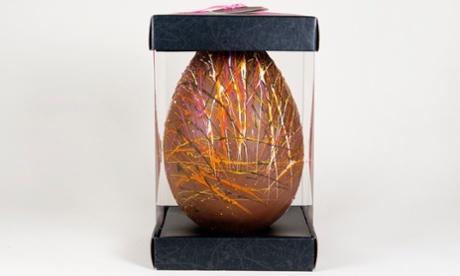 If you want to impress someone, buy them Tesco’s Finest Belgian milk chocolate, hand-decorated egg (£12), a 1kg beast that looks like Jackson Pollock has been let loose on it with good quality white chocolate and (natural, vegetable-based) food colourings. If you have more sense than money, go for a Moser Roth fudge easter egg (250g, £2.99, Aldi). The clotted cream fudge pieces are terrific and it is only £3. Bargain! Dairy- and gluten-free, the Moo Free orange egg (100g, £3.99, Ocado), tastes like orange Matchmakers: bitty with tiny shards (of orange sugar?). It is not appalling, but nor is it melting milk chocolate. Hotel Chocolat’s almond-powder goose egg and “puddles” (buttons to you, 130g, £10) is, supposedly, “as mellow and creamy as our best milk chocolate … with zero compromise on flavour”. Cobblers. It is 56% cocoa solids, tastes more like dark, lacks the “meltability” of milk chocolate and is a little gritty in texture. 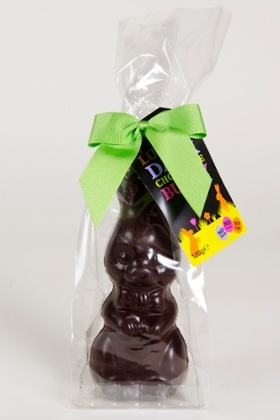 Kinnerton’s “no nuts, no gluten, no egg” hollow bunny (120g, £3, Ocado) is a better option – reasonably interesting dark chocolate – unless you have just won the lottery. In which case, knock yourself out on Booja-Booja’s exceptional dairy- and gluten-free hazelnut crunch chocolate truffles, which cost – and you may want to sit down for this – £9.99 for three (Ocado). Yes, £3.33 a truffle. They come in a keepsake wooden egg, handpainted in Kashmir, which may or may not soften the blow (answer: it doesn’t). 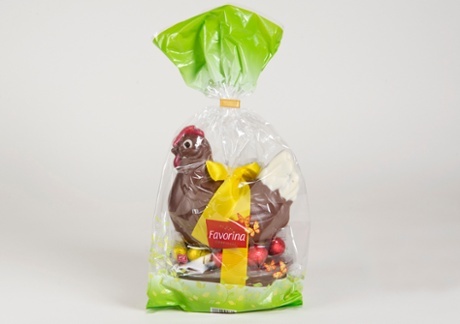 Imagine surprising your little moppets on Easter morning with six real Daylesford hen’s eggs filled with praline. The shock on their faces will be matched only by their screams when the bailiffs come to repossess your car because you have been spending – you absolute bloody lunatic – £25 on half a dozen eggs. Is that praline delicious? Of course it is. But you are paying for clever moulding – see also, Hotel Chocolat’s egg sandwich-shaped caramel crisp (130g, £10); Charbonnel et Walker’s bunny (70g, £5.95, Liberty); Quirky Gift Library’s eight chocolate and caramel carrot tops (£12.95, notonthehighstreet.com). Hotel Chocolat’s Egglet Sleekster filled chocolates (365g, £22) do not taste significantly better than non-egg-shaped chocolate you might buy from Green & Black’s or Lindt, yet cost about four times the price. If you want to treat your kids, buy a Lidl Favorina hen (250g, £2.99, Lidl) or the sinister, aggressive-looking Aldi Choceur bunny (500g, £3.99). Yes, both taste a bit cheap, but your kids won’t care. Avoid Lidl’s Favorina sugar-coated marzipan eggs, however (180g, £1.79); they are disgusting. M&S’s jelly carrots (100g, £1.50) or its tweeting egg box (350g, £5) of sweets – warning: may lead to homicidal rage after hearing it for the 127th time on Easter morning – are similarly daft, affordable and, if you go for Asda’s decorative egg kit (134g, £4), arguably educational. For a bakery item held in such affection by Britain, the hot cross bun is poorly treated on the high street. The M&S luxury pack (4, £1.60) had a heady spiced aroma and plump and juicy “moistened” vine fruits, in decent quantity (33%), but they were hardly a taste explosion; they had a rather unbalanced accent on the citrus peel. Asda’s Chosen By You (4, 85p) had an unpleasantly harsh flavour and spartan currant/sultana content (22%). Tesco’s Finest (4, £1.50) smelled humdrum and, beyond the orange juice-soaked sultanas (30% dried fruit), there wasn’t a lot going on in terms of flavour. They were far better than the Authentic Bread Company’s huge, worthily organic buns (4, £2.99, Abel & Cole), however, with their sparse smattering of fruit and barely-there spicing. 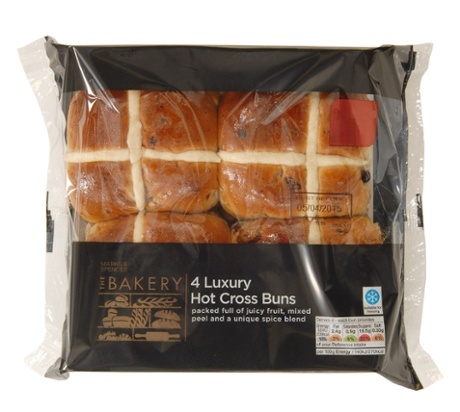 While Rowan Hill’s buns (4, 99p, Lidl) may taste more fruit than strictly hot cross (the spicing is so subtle it is barely discernible), they’re a good option. The orange-soaked sultanas, currants and raisins (28%) and the slightly acerbic citrus peels deliver assertive flavour. Alternatively, go off-piste with Betty’s huge, cake-like chocolate and orange version (520g, £6.25). You are swapping tradition for flavour: a sensible compromise. Simnel is supposed to be delicately flavoured, but the spice/citrus peel notes in the Sainsbury’s Taste The Difference cake (740g, £9) are barely there. It has a decent fruit and nut content but, except for its rather dull, granular layer of marzipan, this could be any fruit cake. In which case, why not go for Paxton & Whitfield’s justifiably named Scrumptious Fruit Cake (540g, £8.25, paxtonandwhitfield.co.uk)? It is one of several high-quality fruit cakes that you will see promoted at this time of year. You might miss the marzipan topping but, in pure flavour terms, it leaves the Cake Academy’s forgettable simnel for dead (740g, £10, Tesco). Likewise, Melrose & Morgan’s simnel (500g, £14.50): although its lightly lemony marzipan is clean and smooth, and chunks of it authentically mine the cake’s interior, it is a dense, dry offering whose spicing is fleeting and ephemeral. 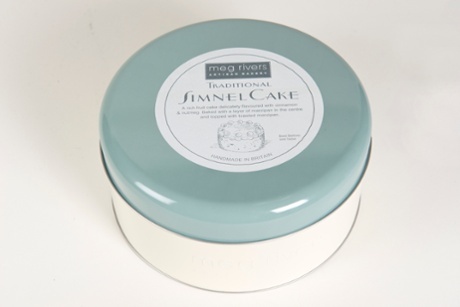 Meg Rivers’ simnel (900g, £20, megrivers.co.uk) is a very good cake. It kept markedly fresh in its tin, and its nicely modulated, toasted-almond marzipan works as a well-judged sweet foil to all those dark, moist vine fruits. This is a cake so rich it tastes deceptively boozy (there is none in there), and the citrus peel is used sensitively, too. Betty’s oval simnel (480g, £15), decorated with icing snowdrops, looks pretty and tastes neat, too. The slightly claggy marzipan has a good almond flavour and the citrus peel, spices, apricot jam and rum combine to produce a confident base flavour. This is a well-balanced, smooth, cohesive cake, although purists may lament the lack of 11 traditional simnel balls on top. The world can be divided into people who swear at the prospect of paying £5 for some biscuits and those who go: “Awwww, little chicks in a basket, aren’t they cute?” The latter have endless opportunities to part with their hard-earned this Easter (£4.75 for 10 spiced Melrose & Morgan shortbreads, anyone? ), topping out, most egregiously, with the £9.50 that Notonthehighstreet.com is charging for six tiny, iced bunny biscuits from Honeywell Bakes. The biscuits are nowt special. It is mind-boggling. Wiser heads will invest in a Sainsbury’s Taste the Difference fruit and spice ring (400g, £1.70), topped with crunchy nuts, seeds and icing sugar, and packed with dried fruit; it goes down very nicely with a dab of butter and a brew. The kids, meanwhile, can devour the Lady Bah Bah cake (£6, Co-op), a basic jam and buttercream sponge with a marshmallow fleece. 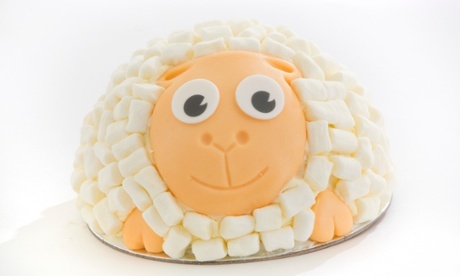 Do not be tempted by the M&S Easter Bunny cake (£12), a carrot cake slathered in insanely sweet cream cheese icing, topped with oddly plasticky moulded sweets and a kind of fence of thick white chocolate. It is utterly and comprehensively vile.